I’d like to wish my sister Laura a very happy birthday – I hope you get everything you wanted all over again! Bot, this is hysterical. I love that “Advent Candles” is a punch line. Just way too funny, man. As usual, I love the expressions and glad to see the shout out to Lor. She deserves it. After all, it’s no fun having your birthday so close to Christmas and New Year’s. That’s like being an Italian and a vegetarian. thanks, man! yes, you can never have too many “advent candle” punchlines. my sister and i feel for ya, Eric. *whew* And now that I can breathe again (after laughing so hard), have to say another great strip! Awesome! I love it… my family does that too!!! …even though my birthday is in May! Excellent job Jefbot! Love the “Advent” candles! ha! your family’s ripping you off funnyshaffer! you need to demand restitution!!! advent candles and fruitcake. very funny! jefbot, these strips make me laugh every time. I don’t know how much is intentional and how much just seeps into your work, but the look in Lor’s eyes in the third panel is devious. Like she’s cooking up a nice cold revenge dish to serve to everyone. so you’re saying that deviousness seeps into my work, eleventeen!? heheh. actually, yeah, it does. happy birthday little sista again! and my sister is a very good cook, and cooks a mean revenge. true that. must run in the family, don’tcha think, xin? We actually threw a surprise “Anti-Birthday” party for my friend, Bryan, 6 months from his actual birthday in the Summer for just such a reason. Great strip! an “anti-birthday”!? great idea, Stan – either for my sister or another strip! Love the advent candles!!! Great job!!! who knew advent candles were comedy gold!? thanks, Mary! Poor Lor. I’m so glad my b-day is in summer! 8D But one of my older brothers and my little sister they both are January kids. And my parents are always celebrating their b-days on the same day (my brother says it suxs to have his BIG BOY celebration along the baby sister celebration – just imagine how the decorations go!! XD). Dad shut him up by saying “you should be thankful we’re celebrating as a separete party or you can celebrate your b-day along the “octavitas” XD My parents are insane and money-wise at the same time!! Since today is my b-day as well, your sister has my deepest sympathies! It should be illegal to give birth a within a month of Christmas – in either direction. …and now I’m going to go ponder how, exactly, that would be enforced. thanks for the comment, z3ncat, and happy birthday! pregnant women can just hold it in an extra couple weeks, right? problem solved. Aw man, what a gyp! it’s true that you’d only get a birthday every 4 years, JefbotFan#300, but think how young you’d stay! I’m familiar with a similiar situation. I always get nothing or cop-out presents for Christmas and real presents on my birthday. Before I started the tradition of people I know getting me stuff for Christmas before Christmas anyway, which led to my family celebrating Christmas several months early, because shopping is easier that way. several months early, Wyvv!? does your family decorate, put up a tree and play Christmas music, too? amazing and bizarre. i like it! what do the logos on everybodys shirt stand for? they might have more significance in the future, seth6, but for now they’re just symbols that represent each character. thats right seth6…it seems everyone has a logo….lol…mombot has dragonfly….lorbor has double L and jefbot has the one similar to the Ripcurl. yep, mombot’s symbol is indeed a dragonfly, lor’s is actually a stylized “LJ” and jefbot is represented by a negative-space “6”. thanks for the *love*, Trones – i’ll just assume it’s there even when you don’t leave a comment! oh, and i’m feeling for your friend’s wife and sister-in-law – yeesh, that’s a whole lotta bad birthday luck for one family! Classic. This is one of those strips where Lor gets to be the normal one and the craziness is happening all around her. I like that, since that’s how I feel…but mostly scared. It’s true that Christmas and New Years has sucked out all the presents and celebrating by the time it’s my birthday, but this year Jefbot bought my cake and I got the one I wanted…not the one Xinda wanted. Thanks, Jefbot. Thanks for the birthday wish JefBotFan#300. Since we’re at it, Happy Birthday z3ncat. yay, i get points for the mint chip ice cream cake! happy birthday, sis! i’ll be sure to pass on your bday wish to Lor (if she doesn’t see it here first), Spanky. and yeah – i agree with you 100% – fruitcake is AWful! in fact, the candles might make it taste better! Stellar work there eervynoe. I’ll keep on reading. (Xinda) Oh, and you are? (SpankyMcBubbles) Thanks. I’m still celebrating. we must settle this through feats of strength, sisters. Damn, know how your sis feels. Birth 6 Jan, haven’t had a Chrissy gift and a BD gift in the same year since …….. well it just doesn’t happen!!!!!!!!! just read your comment in the next strip about living in osaka, Paul – do you spend your summers in australia? man, that’s another place i gotta make it out to soon. bring it on little sista! “It’s time to blow out the advent candles on your fruitcake” In my house we call that line a “stab and twist”, because it smarts worse than a 1-2 punch. Have a birthday near Christmas. 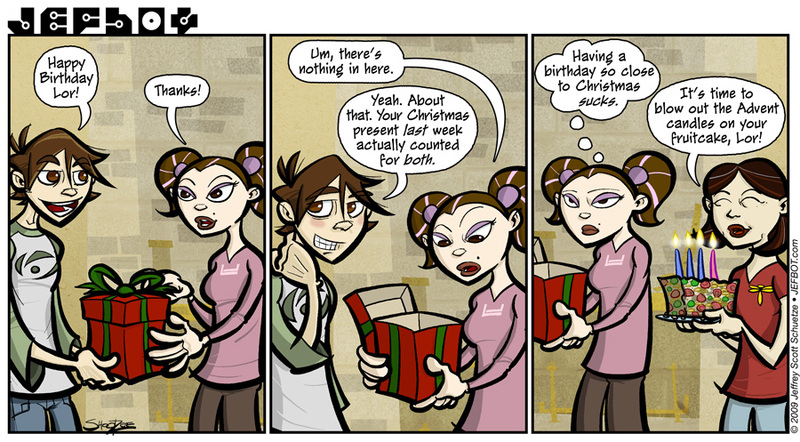 Despite what some people think, it is horrible because friends and family get CHEAP on presents!